Ontario Premier Kathleen Wynne has experienced a surge in popularity since her big election victory in June, a new poll suggests. But like all other provincial leaders, Wynne has quite a way to go before she can catch up to Saskatchewan's Brad Wall — the most popular premier in Canada. 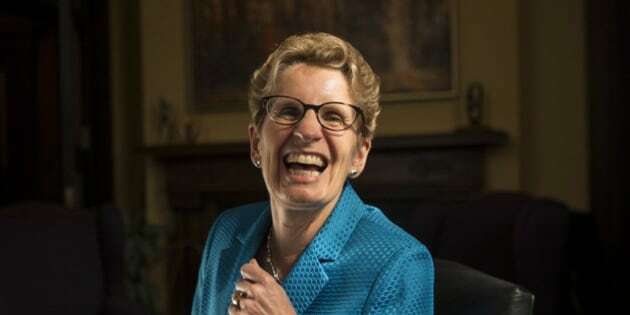 According to Angus Reid Global's newest quarterly survey on the job approval ratings of premiers, Wynne is up eight points from June to 41 per cent support. The Liberal leader captured a majority government that month by crushing the Progressive Conservatives under then-leader Tim Hudak. Wall, meanwhile, has an approval rating of 66 per cent that is virtually unchanged from the last survey. Yet, nearly every other premier saw their numbers go down this summer. Nova Scotia's Stephen McNeil, who once seemed like a contender to take Wall's crown, has slipped 13 points from last quarter to 53 per cent. Newfoundland and Labrador Premier Tom Marshall dropped seven points to 52 per cent, while Quebec Premier Philippe Couillard dipped nine points to 50 per cent. Out West, it appears the bitter labour dispute between British Columbia teachers and the provincial government could be starting to adversely impact Christy Clark's numbers. The B.C. premier went down five points since June to 32 per cent. Sixty per cent of respondents told Angus Reid they disapprove of her performance, while eight per cent said they weren't sure what to make of her leadership. In Alberta, where former federal Conservative Jim Prentice will take over as premier, interim leader Dave Hancock sits at 29 per cent — down 10 points from the last survey. While Prentice aims to breath fresh life into the party that has governed Alberta for decades, the numbers suggest he has his work cut out for him. The dubious title of most unpopular premier in Canada now belongs to a man who is, at this moment, fighting for re-election. New Brunswick's David Alward clocks in at 27 per cent support, down two points from June. Manitoba Premier Greg Selinger jumped four points to 30 per cent support, just good enough to get him out of the basement. With New Brunswick's election day of Sept. 22 approaching and polls already suggesting he's in trouble, it's a safe bet Alward isn't thrilled that 61 per cent of people surveyed in the province want him out of the job. The survey was conducted online among 6,318 randomly selected Canadian adults who are Angus Reid Forum panelists between August 27 and September 4. The margin of error is +/- 1.2%, 19 times out of 20. Angus Reid Global says that, because the sample size in Prince Edward Island is too small, the approval rating of premier Robert Ghiz can't be measured.